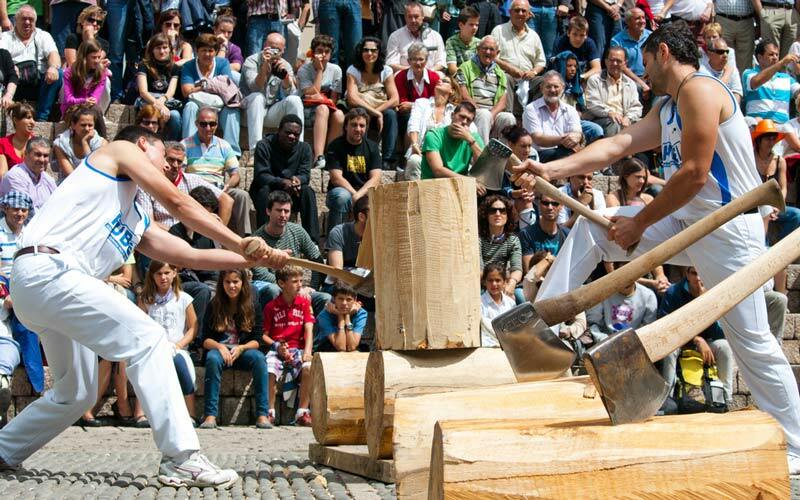 Activities in which there is some kind of challenge, rivalry and in which there is only a winner are known with the word in Basque Joko (traditional sports of Euskadi). This rivalry can occur in all aspects of life: work, courtship, sports, games… with the common denominator that, at the end, “one always wins and one always loses”. This aspect produces tension between the participants and emotion to the spectators. The bipolarity -100% winner and 100% loser- and the fact that the majority of jokos has come into physically demanding jobs, games and activities in the rural field, have linked these type of activities more with men than with women; but in recent decades, as in many other activities, women are increasing their presence in traditional sports of Euskadi. Bets are very common in jokos. 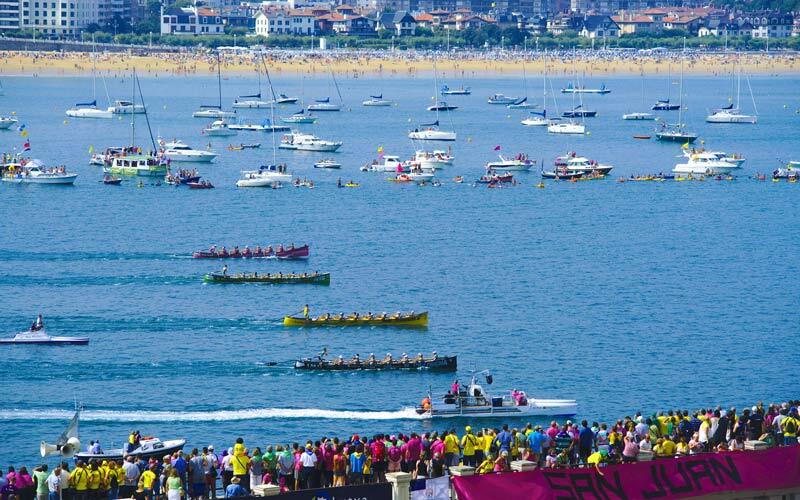 In the coastal field, one of the most traditional sports of Euskadi is rowing (arraun). Traineras races are very usual. These regattas are celebrated in spring and summer in open sea, bays and rivers. Normally, rowers have to go and return to a buoy where they make an spectacular 180º spin (called ‘ciaboga’). If the regatta is in a river, due to the lack of breadth to compete at the same time, the turn of each vessel has to be timed. In recent decades, traditional wood vessels regattas, either rowing or sailing, are increasing. A hamlet (baserri in euskara) represents the survival values of a family in a territory. Because of this, teamwork is required. This type of sport is called in Euskara ‘Herri kirolak’ (land sports) and they are celebrated in the saint patron festivities of the towns of Euskadi and Navarra. There are competitions of trunk cutting -with ax and chainsaw-, weightlifting -of stones, bundles or carts-, stones dragging with animals, bundles or levers throw, collecting corn cob, mowing … among others. There are also some modalities related to industrial work, such as stone drilling. Finally, among the traditional sports of Euskadi, the most internationally well-known is the Basque ball, or fronton (called jai alai abroad). It is a game where two players or two couple of players throws a ball against one or more walls. The particulars of each place and the imagination of the players have multiplied the varieties of the game: it can be played with paddles (long ones or short ones), a kind of long baskets called ‘chisteras’ (used in ‘remonte’ and ‘cesta punta’ varieries), raquets (used in frontenis and sare varieties) or just the hands (protected in some matches with bandages). You can enjoy these ball matches in lots of towns. In addition, there are professional leagues that organise matches in Euskadi, Navarra, La Rioja y Castilla and León. One of the most interesting aspects of this sport are the bets that change as the game is drawing on.